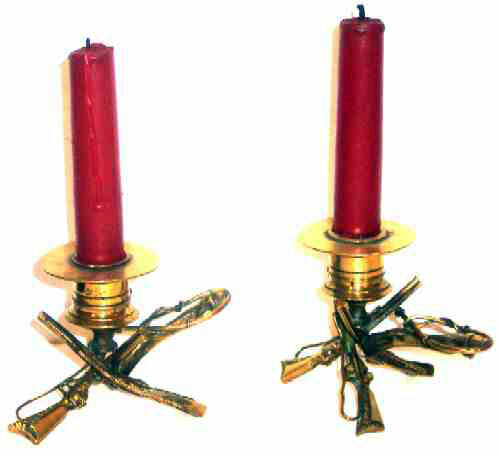 Presented here, a wonderful pair of men's traveling (Campaign) Candlesticks. They are very finely cast and show 3 Double Barrel Muzzle Loaders with Slings, an Animal Leg and Riding Crop. (Cavalry?). The finely cast candle cup shape would indicate late 1700's. The detail is fabulous! They stand 3-1/8" high with the tripod formed by the base being 3-1/4 on each of the 3 sides. The animal leg and crop extends another 2".